As a result of being unable to plug in the ribbon cable that connects the logicboard to the keyboard, and apparently no one else on here knowing how to do it, the connector wound up breaking off the keyboard. Now I need help figuring out a way to connect it. I tried taping it, but it does not work. I guess I will try soldering the cable on next unless someone has a better idea. Does anyone know where I can buy a connector to solder on where the other broke off? Also, does anyone know a website with more active and helpful people, since no one on this one could tell me how to plug in the ribbon cable? Charles Kensington, sorry you feel that ifixit is not a site with "more active and helpful people" Let me see if I can rectify this a bit. My disclaimer here is that I am not a Mac person, but I do know hardware. What are the last three digits of your serial number? It would help me to properly identify your computer, and the hardware used on your computer. Alsop, if you can, post an image of the damaged connector so we can see what you see. "What are the last three digits of your serial number? It would help me to properly identify your computer, and the hardware used on your computer. Alsop, if you can, post an image of the damaged connector so we can see what you see." 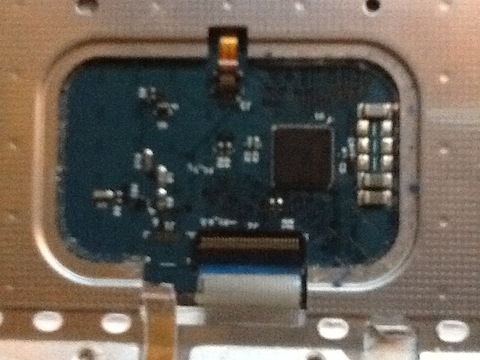 There are 8 contacts on the board where the connector was left of the larger connector, and the ribbon cable has eight contacts. Std Storage: 80 GB (5400 RPM) Std Optical: 8X "Combo Drive"
Charles Kensington, how desperately do you want to solder the connector? It would be easier to replace the trackpad part number 820-2085-A. The connector itself is a Molex 53307-8610. I checked pretty much everywhere I know for the connector but have not had much luck at all. Sorry but you will not be able to solder the connector or the ribbon cable in place. Buy a used trackpad and replace the faulty one.